We are here to help you. Nearly all our products are listed. You may prefer to telephone for a chat or discussion about what you want. We know prices have increased dramatically and we will do our best to offer you the best price. The two boxes arrive wednesday just before christmass, so it was perfect. Thanks for fine service, and great guidance along the road. Happy new year. Just a small note to tell you that I have received the cars perfectly today, thanks. pit lane arrived this morning 7.55 a.m. Many thanks for the extra trip to the post office and the special delivery!!! I said to Joe it won't be here before the weekend and now he'll have a package to open after school. He'll be over the moon. Thanks again for the brilliant service! Hello Nic, I received the black box. Thank you very much. I trust in you. you're honest and professional. Thank you! Jérôme. week from U.K. to Mexico City area. Congratulations!!! Victor Castillo. 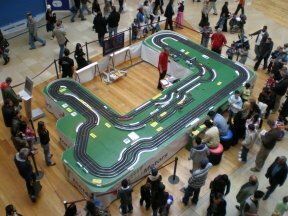 Giant Scalextric hire for private and corporate events. We have both analogue and digital allowing lane changing. Our tracks can be up to 16 cars. Hire a small track from £250 for use at your party. We can custom build a track to your requirements. Our standard giant scalextric racing tracks are 4 and 6 lane which are 18x10foot ( 6m x 3.5m). We also have ho scale afx racing track and cars and therefore you get a lot more track in the same space as the large scalextric 1/32 size. Each day saw 100 spectators on average watching the racing at any one time. We also recorded the names and address of 600 people per shopping centre. A constant race commentary was provided highlighting the company and the prizes on offer. 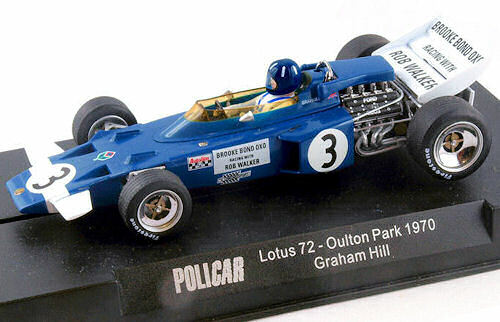 Like Hoover Scalextric has become the worldwide generic name for 'slot car racing'. We are only 10 minutes from M25 and 30 minutes from Euston main line. Visitors by appointment only. Telephone 020-8421-5922. Giant scalextric track for hire. We run race meetings with standard slot car track or digital. Or we can provide a huge scalextric track just for fun. Call us for details. Patented way back in 1930! Not on sale till 1950's market leader was Scalextric. It started in England, and was brought to America and other countries in the world by returning servicemen. In 1948, the war was over and leisure time was in abundance. Modeling became the perfect "at home" past time and a great many modelers wanted a system where model cars would motor around layouts in conjunction with trains and boats to produce a complete model layout. An article by Geoffrey Denson in the English magazine "Model Cars" is credited with starting the movement in Great Britain. His article was about a model car track system that used a raised "railroad" like rail to control the vehicle. These were called Rail Cars and this system became the most popular in Great Britain up through the mid 50's. Alban Adams was a popular track builder in England and is credited with building the first recessed slot track. Reportedly because he was tired of his car "tripping" over the rail in the turns. Still, rail racing would be the track of choice in England well into the '60's. New digital systems are continuously being developed. Scalextric Sport and Ninco resistance controllers are connected to the track with a jack plug. 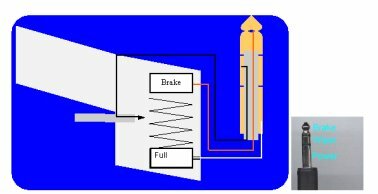 These are connected as shown . The cable end contact is connected to the power band (L on a BSCRA style plug). The center contact is connected to the the controller wiper (N on a BSCRA style plug). The end contact is connected to the the controller brake band (E on a BSCRA style plug). if you need more help call us. 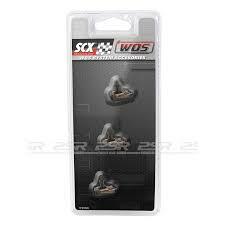 We have a number of great value scx c4 sets set with pro parma controllers. all clubs receive a mega discount in March 2013 . We need your club name and url and an image.